Opting for an Islamic wedding has become a favored choice for many urban Muslims in China. Zhe Yagang, 25, is a Muslim working at an IT company in Beijing. Yang Liu, his newly-wed wife, also a 25-year-old Muslim, is an auditor at a medical company. Although the couple were raised in secularized households, they celebrated their wedding in Islamic style, because they consider it is fashionable and a way to please their parents. Shortly after a friend gave them contact information for a Muslim wedding planning company in Beijing, they quickly called to make arrangements. 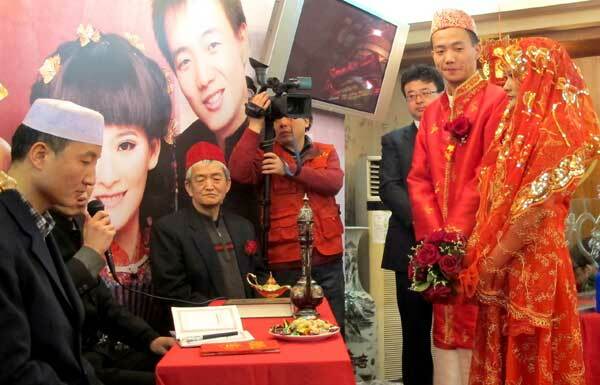 They paid 8,000 yuan ($1,265) to book the wedding and 700 yuan to rent Muslim wedding dresses. The wedding took place on a Saturday morning in March in a dining hall at Hongbinlou, a famous restaurant that has served halal food since 1853. Most of the guests sitting around the tables were Muslims. When the couple entered the room, followed by two ring bearers, a 6-year-old boy and 4-year-old girl, their festive red and full Islamic design attire received warm praise and admiration, especially the elegant bridal gown and hijab. “I seldom wear a cap. It is for very special occasions only,” Zhe said. Having the ring bearers was the couple’s own initiative, to bring some romance and Westernized modernity. Following the wedding planner’s advice, the couple invited two imams to officiate the ceremony and write their names as husband and wife on a marriage contract, something required by Islamic teaching for a proper wedding, yet totally unfamiliar to them both. “We’re instantly interested. Our parents held simple weddings and never told us anything about that,” Zhe said. They had limited contact with imams earlier in their lives. The couple offered each imam money for the service and waited until they left to bring alcohol to the table. After the marriage contract was signed, Zhe Jiulan, the groom’s aunt, went on stage as an honored witness to read aloud the civil marriage certificate they registered last June. It was the first traditional Muslim wedding that Zhe and many of the guests had attended. “Such ceremonies send us strong visual reminders of our faith,” she said. Her son, Li Xu, 23, was the best man at the wedding, and wore a dark suit. Li said the experience made him want a similar wedding. His parents were skeptical when Li first brought home his Han Chinese girlfriend, Zhang Jing, a non-Muslim undergraduate classmate. “My parents took a while to come to terms with my choice. I know they will be pleased if I celebrate my wedding in Muslim tradition,” Li said. He has other plans in mind, too. Since his girlfriend is from Gaobeidian, Hebei province, Li said they are considering two ceremonies, a Muslim one in Beijing and a fancy church wedding in Hebei. “We’re open to all interesting options. It is still too early to seriously plan,” Li said. Ma Nenzhi, 47, a Muslim migrant worker from Dengfeng, Henan province, is a dishwasher at Hongbinlou, where the wedding took place. She said the restaurant is a popular place for Muslim wedding receptions, particularly on weekends. Mixed marriages, usually involving a Muslim man and Han Chinese woman, are on the rise in Beijing and Ma’s hometown, she said. Ma’s 19-year-old son is a student at Zhengzhou University in the capital of Henan province. Ma said it will be up to him to decide whom he wants to marry. “But the girl should accept basic Muslim practices,” Ma said, adding that in her village many Han Chinese women, after marrying their Muslim husbands, must take a ceremonial bath at a mosque and be given a Muslim name by an imam. Wang Yong, 35, the Muslim wedding planner, said 50 percent of his target clients are Muslims. Their choices and requests for traditional Muslim wedding vary. Among those considering a Muslim wedding, some favor a simple celebratory party with close friends and relatives, such as Zhe’s wedding. Some celebrate twice, paying equal attention to both, in Muslim style first, followed by Western dresses and procedures. Some show more interest in exotic white wedding gowns and treat the Muslim traditions as a formality, Wang said. “We want to satisfy all tastes and preferences,” Wang said. In his studio, he proudly presents a wardrobe containing dozens of Muslim wedding gowns in festive colors and elegant designs. The wardrobe can be rented at the ceremony or for shooting wedding photos. Wedding music in Arabic, Muslim marriage contract documents to be officiated by an imam and decorations are also available. Urban Muslims now have different wedding choices, and not all of them adhere to Islam. Some are reviving past Confucian wedding customs to perform bows first to Heaven and Earth, then to the parents from both sides, and last between the bride and groom, Wang said. Facing growing competition that advertises the skills and capacity to stage Muslim weddings, Wang is confident that his service stands out because of his inside knowledge of both Islam and the wedding planning business. No alcohol was served during Wang’s wedding, a policy that he promotes but is not always followed at Muslim weddings. At another Muslim wedding in March that Wang orchestrated, alcohol was served after a brief ceremony presided over by an imam. The groom Ma Yonghui, and the bride Zhao Qian, also changed into a suit and white wedding gown. The audience laughed when the groom Ma knelt down on one knee and proposed again. He later sang a popular love song in Chinese, with Karaoke effects, dedicated to the bride Zhao. Ma greeted the bride on the red carpet while the wedding march played. He collected a handful of roses from friends and relatives who stood nearby and showered them with rose petals, declaring his love for his bride and kissing her. “We want to please family elders by following the Muslim rituals and also have non-Muslim guests in keeping with the process,” Ma said. Ma Ping, a Muslim scholar from the Academy of Social Sciences in the Ningxia Hui autonomous region, said the practices of different Muslim weddings indicate the growing diversity in China’s Muslim community and a culture not assimilated but influenced by ethnic and religious differences. “Muslim weddings do not carry a singular form in China. Young people’s novel ideas of hybrid wedding plans that combine tradition and mainstream fashion will receive fewer objections from parents and seniors,” Ma said. In Ningxia, an area in Northwest China with a strong Muslim culture, Ma sees a clear difference in wedding ceremonies held in the capital city Yinchuan and its suburbs. In suburban and rural areas, traditions are more strictly followed. Any attempt to change them may be met with stern resistance from the older members of the family, Ma said.